Since the classical Freudian and ego psychology paradigms lost their position of dominance in the late 1950s, psychoanalysis became a multi-paradigm science with those working in the different frameworks increasingly engaging only with those in the same or related intellectual "silos." Beginning with Freud’s theory of human nature and civilization, Psychoanalytic Thinking: A Dialectical Critique of Contemporary Theory and Practice proceeds to review and critically evaluate a series of major post-Freudian contributions to psychoanalytic thought. In response to the defects, blind spots and biases in Freud’s work, Melanie Klein, Wilfred Bion, Jacques Lacan, Erich Fromm, Donald Winnicott, Heinz Kohut, Heinrich Racker, Ernest Becker amongst others offered useful correctives and innovations that are, nevertheless, themselves in need of remediation for their own forms of one-sidedness. Through Carveth’s comparative exploration, readers will acquire a sense of what is enduringly valuable in these diverse psychoanalytic contributions, as well as exposure to the dialectically deconstructive method of critique that Carveth sees as central to psychoanalytic thinking at its best. Carveth violates the taboo against speaking of the Imaginary, Symbolic and the Real unless one is a Lacanian, or the paranoid-schizoid and depressive positions unless one is a Kleinian, or id, ego, superego, ego-ideal and conscience unless one is a Freudian ego psychologist, and so on. Out of dialogue and mutual critique, psychoanalysis can over time separate the wheat from the chaff, collect the wheat, and approach an ever-evolving synthesis. 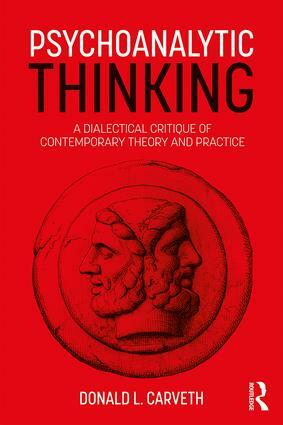 Psychoanalytic Thinking: A Dialectical Critique of Contemporary Theory and Practice will be of great interest to psychoanalysts and psychoanalytic psychotherapists and, more broadly, to readers in philosophy, social science and critical social theory. Is there a future in disillusion?